A media release in October 2016 by SriLankan Airlines stated among other things, “The airline’s Group Loss stood at LKR 9.03 billion, which represents a 45% improvement for the 2015/16 financial year compared to the previous year” (2014/15). The annual report confirmed a Group Loss of LKR 9.5 billion, excluding a penalty charge of LKR 2.5 billion, paid for cancellation of one A350-800. The media release by the national carrier published by The Island last week titled “Brighter skies over SriLankan Airlines financial position” states, “Contrary to inaccurate reports in the press, the management of SriLankan Airlines would like to point out that since the Unity government was formed, the airline’s losses have been dramatically reduced.” It further reported a ‘draft’ (unaudited) loss of LKR 13.4 billion during 2016/17 excluding LKR 14.3 billion, paid for cancellation of several A350-800 aircraft. 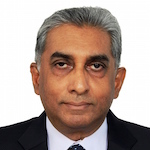 To describe a LKR 3.9 billion or 41% increase in year on year Group Losses, despite the discontinuation of traditionally loss-making routes of Frankfurt, Paris and Rome as a “dramatic reduction of losses since the unity government was formed” is to be mendacious. However, the present directorate and management can and should be held accountable for their inability to achieve an Operating Profit (surplus) in its core business operations. An Operating Profit / Loss has no relevance to servicing previous loans and payments for future aircraft deliveries / cancellations. Unlike Sri Lankan Rupee figures, US Dollar figures has no bearing on the depreciation of Sri Lankan Rupee. Core business activity of an airlines consist of ‘Passenger & Cargo Transportation, carriage of Mail & Excess Baggage, ad hoc flights (charters) and Frequent Flyer net accruals. Revenue derived thereof is referred as Traffic Revenue. Operating Profit (surplus) is the positive variance between Traffic Revenue and Operating Expenditure, expenditure related to generating Traffic Revenue. Ancillary activities such as Ground Handling, Engineering Services, Duty Free Sales, Catering, Training Centre etc. do not belong to core business activity. The Operating Deficit in 2016/17 amounts to USD 110 million compared to USD 87 million in 2015/16, an increase by 26%. One of the reasons attributed to the “weakening of the balance sheet” in the media release was the non- recovery of “drop in ticket prices” as a result of “fuel price reduction in 2015”. Nevertheless, a reliable source stated “average fuel price paid by the airline in US cents per gallon in 2016/17 was 3% less than average price paid in 2015/16”. The national carrier is undergoing an identity crisis. It is unable to decide if it is a long haul / legacy carrier, regional carrier, intra-regional carrier or a budget carrier. According to the carrier’s website, it currently operates 23 aircraft comprising of 13 wide-bodied and 11 narrow-bodied aircraft to 41 destinations including Melbourne due to commence on October 29. Most carriers, after careful study of new routes demand in existing routes, acquire aircraft for route expansion. SriLankan Airlines introduces new destinations and increase frequency to existing destinations due to an excess of aircraft. One is intrigued. Assuming ‘leadership route’ means the operation of non-stop flights, were not Frankfurt, Paris and Rome too ‘leadership routes’ with sizable ethnic markets similar to Australia, in addition to established tourist markets to boot? SriLankan Airlines operating four weekly flights to Frankfurt was virtually driven out of the German market by Emirates, Qatar, Etihad and Oman Air who collectively operate to Dusseldorf, Munich, Berlin, Hamburg and Hannover besides Frankfurt. Australia too have international gateways in Sydney, Adelaide and Perth besides Melbourne. Emirates, Singapore Airlines, Malaysian, Thai and Cathay operate to these gateways and are able to connect Colombo bound passengers through their respective hubs. Did decision makers consider reintroducing Frankfurt instead of Melbourne using aircraft with a monthly lease charge of USD 225,000? Germany is a tourist market established over five decades. This writer who strongly advocated a total withdrawal from UK and Europe in the past, opines, Frankfurt with established tourist and ethnic markets would have been preferable to Melbourne with an ethnic market but no established tourist market. The airline is saddled with three unwanted ancient Airbus A330-200 wide-bodied aircraft due an erroneous, arbitrary and unilateral extension of lease agreements by the CEO. Total lease cost for three aircraft 6 years lease period amounts to USD 54.54 million. This transaction will “weaken the balance sheet” annually whilst the culprit, recruited for a princely salary of Rs 3 million plus perks, is not disciplined. To be fair, a majority of directors objected to CEO’s decision. They were over ruled by a cabinet sub-committee. As a result, this costly mistake was not discussed during the meeting between Board members and CEO with the President, Prime Minister and cabinet of ministers last Tuesday. Recruitment and Promotions appear to be on ad hoc basis rather than on a need based criteria. Despite all the bruhaha in media releases on cost conservation, there has been no reduction in employee numbers since January 2015. Average number of employees in 2015 and 2016 were 6,987 and 6,959 respectively. Current employee count including 110 employees absorbed from now defunct Mihin is 7,029. Fleet size has been 21, 21 and 23 aircraft in said three years. Retirement and resignation of staff are routine occurrences. It is understood, over 1,100 replacements have been recruited since this directorate assumed office, despite increasing losses and discontinuation of some loss-making destinations. A few months ago, two Grade 11 General Managers responsible for Worldwide Sales and Revenue Management, Planning & Commercial Support in the commercial division were upgraded to Grade 12 Head of Division positions, despite the reduction in their job size and responsibilities. Both vacancies had single applicants and were one horse races. Post of Head of Marketing has been shelved. There were three applicants. From Emirates management era, holder of Grade 12 Head of Service Delivery position overlooked Airport Services and Inflight departments. A former serviceman, placed in the HR Division in a Grade 10 position by previous administration was promoted to Grade 11 and titled General Manager Airport Services and Head of Service Delivery re titled Head of Inflight by current CEO. General Manager Airport Services was recently promoted once again to Grade 12 and re-designated Head of Airport Services. For no justifiable reason, one Grade 12 position has been split into two Grade 12 positions, incurring two salaries, perks and vehicles to carry out same work load, hitherto carried out by one person. During a recent trip to Singapore, this writer utilized SriLankan Airlines. 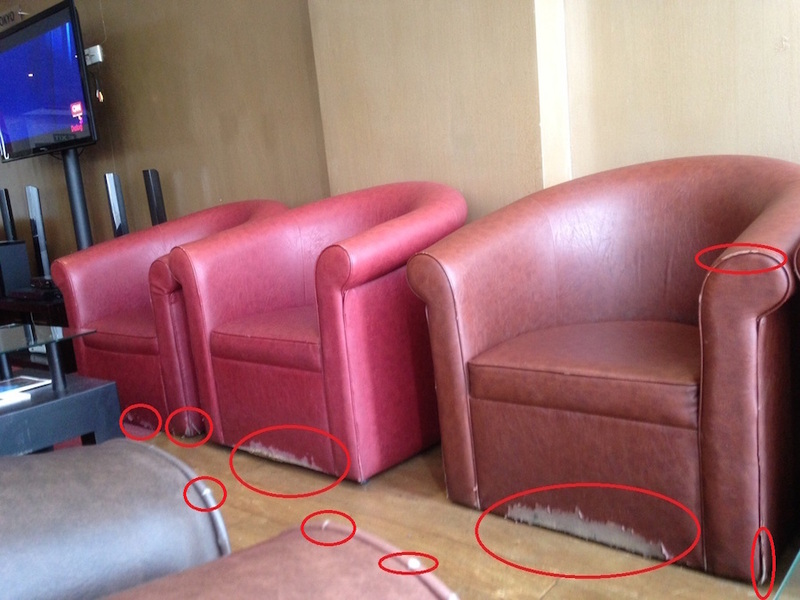 Seated in the Serendib Lounge for Business Class passengers, it was shocking to observe more than 50% of the lounge chairs badly worn off, torn and faded. The accompany photograph says it all. 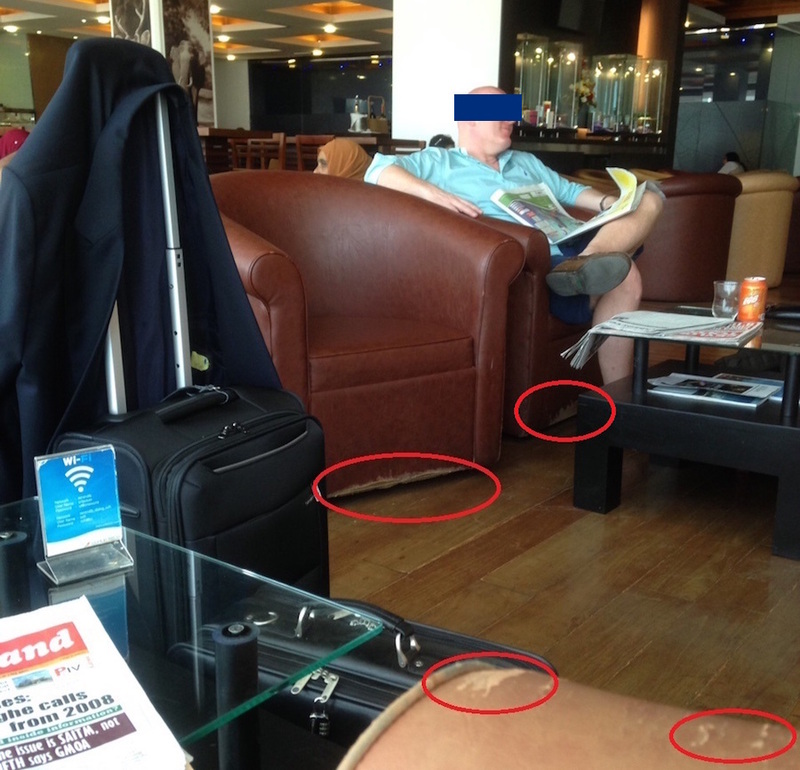 After much thought, this writer decided to utilize one of the photographs taken with a mobile phone in the hope, it would prod Board members and highly paid airline officials with international expertise who are also regular users of the lounge to take remedial action. Charging over half a million rupees and providing such lounge chairs gives the country, carrier and people a bad name. Meanwhile, the skies over SriLankan Airlines gets darker by the day. I agree that Melbourne would be a disaster. Also not extended to Sydney. There are no tourists from Aussie and get ready for massive losses next year. Amazing that no one takes responsibility for poor performance of Sr Lankan. The board, management, Minister, PM are all silent and having a good time at the expense of tax payer money.!! Sri Lankan should be positioned as a regional airline to Sin, KL, Bangkok, India and Middle East. Get a good board of directors and tie up with a middle eastern airline and that is the only way out. Currently they have 250 staff per aircraft when large airlines run with half of that!!! Many of us usually write on politics. Economy is much more important. As the author shows, the past liabilities are not a reason for operating losses. Therefore, there is an obvious management problem. People like Rajeewa Jayaweera should write more and more on these matters. I wonder whether Sri Lankan enterprises (public and private) employ business/organizational excellence frameworks. For public enterprises, it could be compulsory. Most of these business excellence frameworks are suitable for the public companies as well, although mere adoption of such might not solve the problems. The Board of Managements should take the responsibility and accountable. I am aware of a Sri Lankan Air employee who has taken ‘no pay leave’ for more than a year several times in the past few years to be with his family abroad. Even during his absence form work, he & his family continues to enjoys free first class travelling. Obviously, if his work can be covered by others for more than a year, it is a sign of excess staffing & I can’t think of any other private Company who would grant this type of privileges to employees when the head count is the first to be scrutinized when it comes to reducing costs..
We knew that SriLankan Airlines is deliberately managed badly to perpetuate corruption. Thank you Rajeewa Jayaweera for providing us numbers. We have to pay Rs2.6billion for cancelling the contract to lease a plane! Would have been cheaper to pay up the backhander. The present GoSL is allowing the run down and therefore is complicit. The silver-lining is reformers like Rajeewa Jayaweera are speaking out. Mr. Rajeeve Jauaweera: Why you took this trouble to “Narrate” all these facts? Instead you could have in summery said: This Sri Lankan Airline is not second to “Meetotamulla Garbage Hill”. The only difference is, that “Garbage Hill” killed thirty odd and destroyed few homes and displaced some people living near it. In the case of Sri Lankan Airline, it has and continues to KILL the whole NATION. The worst is this Government WILL NOT find any solution. The very PROBLEM allowed “Weliammuna” Committee to collect another cool Rs. 4 million from the public coffers. That was yet again a “Hit” on the People. Mark my words: This “BS” will continue unabated. If you leave the directors of the previous Board and this one aside, then you drill down to the management. The most important are the marketing people. The same lot barring present CCO was there in the previous board regime and here as well. They are the common factor in the huge losses since the departure of Emirates. To think this board gave promotions to a lot who failed miserably so far speaks volumes about the capability of the board. Almost rupees 3 million per month is being spent as insiders know for the current CCO imported. But what has that person done for the airline? This is a demonstration of how empty the current marketing management is, who should be the engine driving the business. It seems the engine is broken. Things appear to be rapidly coming to a head with regard to SriLankan. Most of the aircraft in the SriLankan fleet are leased at above market rates. In addition they are leased on 12 year leases and I understand these leases do not have a termination clause. The net result of these lease deals is that it is now impossible for SriLankan to make money – it doesn’t matter what they do. Several Billion in forward liabilities means nobody will buy this Airline. It is also impossible to turn this around. 49% ownership is also a non starter as it doesn’t give any buyer operational control. There is no way out for SriLankan. The only option is bankruptcy – the quicker the better imho. It’s not all bad though – some people have pocketed huge sums (over $100 Million Dollars in Commissions on the aircraft order alone). Others enjoy huge salaries and perks for doing absolutely nothing. To the best of my knowledge not a single Rupee has been recovered and all investigations into the Corruption and Racketeering at SriLankan have been blocked are are “talk” only. Unfortunately Sri Lanka has become a Failed State – the Rule of Law is completely absent. Instead there is a culture of impunity and zero accountability.